Taking in this concert at The Manchester Evening News Arena, I can confirm that I’ve been watching Paul Weller live for 36 years. There have been some average, bordering on poor gigs, but mostly, Paul Weller live, with a well-rehearsed band, is a quality concert. My previous Weller gig in April 2017 in Mount Pleasant, Liverpool, was a disappointing event with Weller reacting to the crowd, “I don’t mind, I’ll just go and have a cup of tea”. Tonight though, back on the arena tour, Weller and band, including long term guitarist Steve Craddock and Liverpool drummer Steve Pilgrim, were on form for the quarter filled arena, due to weather problems affecting travel. Weller was promoting his new album, ‘A Kind Revolution’, but only played four songs of the LP out of a thirty one song set list. Other songs included twenty one solo tracks, seven by the Jam and four by his second band, ‘The Style Council’. The fact that he played very little of the new LP disappointed me as this LP has some very strong songs, and this was a change from his ’Into Tomorrow’ approach to his career, which has kept him relevant as he approaches his bus pass age. But tonight, he parked the bus and relied on his back catalogue to please the crowd. This is not to detract from an excellent concert. But as he played one old song after another, my thoughts swayed to “Is Weller compromising his art to please the audience?” by playing songs such as ‘Broken Stones’, ‘You do something to me’, ‘That’s Entertainment’ and the over-played party trick ‘A town called Malice’. The luxury to have such a variety of songs to meet the needs of the paying punter is impressive, but is Weller becoming predictable on the live circuit? The quality is always on show, but occasionally, inspiration is not. There are two types of Paul Weller fan, those who want to hear all the hits, to which he catered for tonight, and those who wish to hear the new songs. I’m of the latter I suppose, but not the majority, so tonight, for me, felt like one of those revival tours that 1980s or 90s bands reform for and Paul Weller despises. So what does the future hold for a Paul Weller live show? Does he need to re-evaluate his stage persona and reignite himself so not to be complacent? 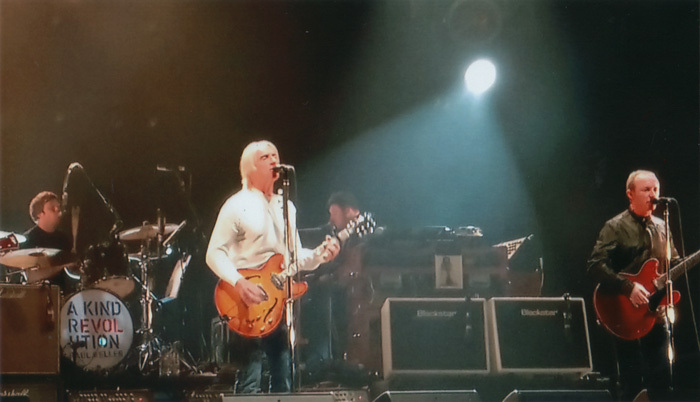 Paul Weller has more talent than to simply stand still and admire what he has done, and he is always looking for the next phase of his musical career. Judging by his recent releases, ‘Wake up the Nation’, ‘Sonic Kicks’, Saturn’s Pattern’ and a ‘Kind Revolution’, he still possesses the talent and drive to re-invent himself musically. Perhaps he needs to transcend that gift to his live shows to keep evolving and motivated. The fire and skill are still prominent but lacking direction.